TONS of off street parking for trucks and trailers- ATVs, boats, snowmobiles...bring them here! Bring your snowmobiles, boats, trucks, trailers and friends & family- this 5 bedroom, 3 bath home within short walking distance to town is the perfect set up for large groups. Sleeps 12 in beds (and can accommodate up to 16 with 2 provided air mattresses and your sleeping pads). At 3074 square feet and 3 stories with 2 FULL kitchens and a large deck, there’s room for everyone- including your trailers, toys and dog! The Inn Town Retreat is 2 short blocks to the heart of downtown McCall- Payette Lake, Marina boat launch, Legacy Beach, restaurants, pubs, coffee shops and shopping. The large driveway/parking area can easily accommodate 3-4 full size trucks with large trailers, with a large entrance making it easy to back them all in. The Inn Town Retreat is 2 blocks from the Marina, making it quick and easy to launch boats in the summer. The Inn Town Retreat was built in 1981 and the new owners have made upgrades to make your experience more comfortable and enjoyable including fresh paint, new flooring, new rugs, new carpet, and all new stainless steel kitchen appliances on the main level of the home. This is a classic McCall cabin with an old school feeling- it’s all about the good times and making memories with your friends and family! 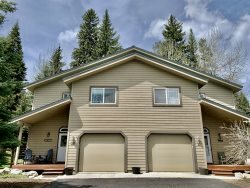 All that you need is included in this home and after a fun day exploring and playing in McCall you can return and relax in a clean and comfortable house. Immediate upgrades include: brand new linens in all bedrooms and bathrooms, new and complete dish sets and cookware, BOSE docking station (Bluetooth compatible), propane BBQ on deck, high speed WiFi, and Internet TV’s with Cable TV. The first floor features a full kitchen, living room with Cable served Internet TV, bathroom and 2 bedrooms- one queen and one king. No stairs are required to access this first level. Walk up stairs and you are on the main floor of the home with large picture windows that overlook the large deck, the peek a boo lake view and a gorgeous sunset! This level of the home is where the deck is accessed, where you can enjoy morning coffee, happy hour and BBQs with room for everyone. The main level includes the primary kitchen, living room with Internet TV with Cable, laundry room, full bathroom and king bedroom. Upstairs, on the third floor, are two bedrooms- one king and one with two full-size beds, as well as another full bathroom. The king bedroom has a small balcony looking towards town and the marina. Your four legged friends are welcome at the Inn Town Retreat with an additional pet fee. Bring your toys and trailers- PLENTY of off street parking for vehicles and trailers (use of garage is NOT included in rental). Pet Friendly! $50 per dog, non-refundable, with a 2 dog max at the home.